I am after some 700c wheels and am prepared to pay up-to £250, I want them to be very light, not carbon and be able to cope with extreme climb hills. My plan is to build a new retro racer that is a sleeper that can do just as much as the new boys!!! Any advice would be great!!! I don't mind if they are seconds. Last edited by retroracer on Fri Oct 26, 2012 1:00 am, edited 1 time in total. thanks I shall have a look!! I'd go for a classic setup of decent silver hubs (Campag Chorus / Record or Dura Ace if you must) and Mavic Open Pro or Ambrosio Excellence. It looks good on anything. 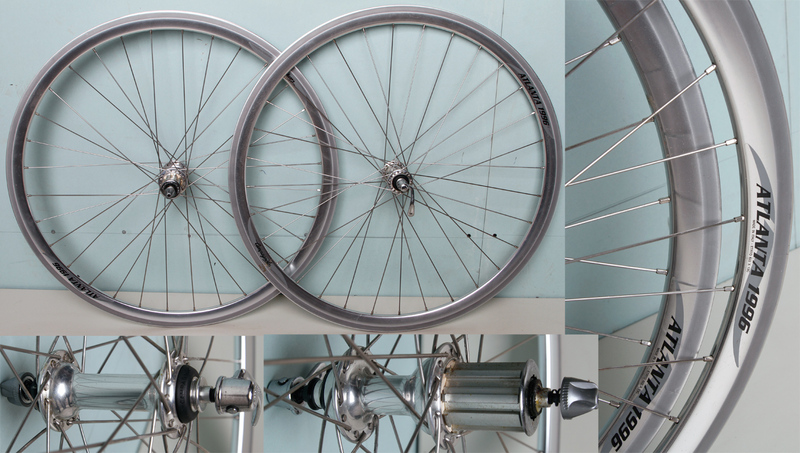 For a slightly more retro look, choose any high-flange front hub. Campyoldy has Excellence in stock. do you want tubs or clinchers? cassette or freewheel? how many sprockets? Do you want make retro wheels or new look for example 20/24 h ??? what is your weight ?? I have a retro road bike and modern wheels, look very good i think. Don't like to put up links belonging to Hilary Stone but checkout these wheels ! Its hard for me to see past the Mavic GP4, Campag C Record hubs and a decent set of tubs ! I was running my Vitus 979 on Mavic MA40's - I noticed a good difference when I switched over to GP4's - Or else I am getting fitter ! You can Never have too many Peugeot Bikes in One House ! I've got a mint set of Mavic Helium clinchers, not super light at 1700g but they are super smooth and look the dogs. will throw in some near new Schwalbe Stelvio tyres.